Siderite is also the name of a type of iron meteorite. Siderite is a mineral composed of iron(II) carbonate (FeCO3). It takes its name from the Greek word σίδηρος sideros, “iron”. It is a valuable iron mineral, since it is 48% iron and contains no sulfur or phosphorus. Zinc, magnesium and manganese commonly substitute for the iron resulting in the siderite-smithsonite, siderite-magnesite and siderite-rhodochrosite solid solution series. Siderite has Mohs hardness of 3.75-4.25, a specific gravity of 3.96, a white streak and a vitreous lustre or pearly luster. It crystallizes in the trigonal crystal system, and are rhombohedral in shape, typically with curved and striated faces. It also occurs in masses. Color ranges from yellow to dark brown or black, the latter being due to the presence of manganese. Siderite is commonly found in hydrothermal veins, and is associated with barite, fluorite, galena, and others. It is also a common diagenetic mineral in shales and sandstones, where it sometimes forms concretions, which can encase three-dimensionally preserved fossils. In sedimentary rocks, siderite commonly forms at shallow burial depths and its elemental composition is often related to the depositional environment of the enclosing sediments. In addition, a number of recent studies have used the oxygen isotopic composition of sphaerosiderite (a type associated with soils) as a proxy for the isotopic composition of meteoric water shortly after deposition. Although spathic (carbonate) iron ores, such as siderite, have been economically important for steel production, they are far from ideal as an ore. The recovered ore also has drawbacks. The carbonate ore is more difficult to smelt than a haematite or other oxide ore. Driving off the carbonate as carbon dioxide requires more energy and so the ore 'kills' the blast furnace if added directly. Instead the ore must be given a preliminary roasting step. Developments of specific techniques to deal with these ores began in the early 19th century, largely with the work of Sir Thomas Lethbridge in Somerset. His 'Iron Mill' of 1838 used a three-chambered concentric roasting furnace, before passing the ore to a separate reducing furnace for smelting. Details of this Mill were the invention of Charles Sanderson, a steel maker of Sheffield, who held the patent for it. These differences between spathic ore and haematite have led to the failure of a number of mining concerns, notably the Brendon Hills Iron Ore Company. Spathic iron ores are rich in manganese and have negligible phosphorus. This led to their one major benefit, connected with the Bessemer steel-making process. Although the first demonstrations by Bessemer in 1856 had been successful, later attempts to reproduce this were infamously failures. Work by the metallurgist Robert Forester Mushet discovered that the reason for this was the nature of the Swedish ores that Bessemer had innocently used, being very low in phosphorus. Using a typical European high-phosphorus ore in Bessemer's converter gave a poor quality steel. To produce high quality steel from a high-phosphorus ore, Mushet realised that he could operate the Bessemer converter for longer, burning off all the steel's impurities including the unwanted phosphorus and the essential carbon, but then re-adding carbon, with manganese, in the form of a previously obscure ferromanganese ore with no phosphorus, spiegeleisen. This created a sudden demand for spiegeleisen. Although it was not available in sufficient quantity as a mineral, steelworks such as that at Ebbw Vale in South Wales soon learned to make it from the spathic siderite ores. For a few decades, spathic ores were now in demand and this encouraged their mining. In time though, the original 'acidic' liner, made from siliceous sandstone or ganister, of the Bessemer converter was replaced by a 'basic' liner in the developed Gilchrist Thomas process. This removed the phosphorus impurities as slag, produced by chemical reaction with the liner, and no longer required spiegeleisen. From the 1880s demand for the ores fell once again and many of their mines, including those of the Brendon Hills, closed soon after. Fossiliferous siderite concretion from the Lower Carboniferous. ^ Some siderite, along with goethite, also forms in bog iron deposits, but these are small and economically minor. ^ Both ironstones and banded iron formations are sedimentary formations, thus the economically viable deposits may be considerable thicker and more extensive. ^ Russell Garwood, Jason A. Dunlop & Mark D. Sutton (2009). "High-fidelity X-ray micro-tomography reconstruction of siderite-hosted Carboniferous arachnids". Biology Letters. 5 (6): 841–844. doi:10.1098/rsbl.2009.0464. PMC 2828000. PMID 19656861. ^ Sedimentary Geology, p. 304. ^ Jones (2011), p. 34–35,37. ^ Prothero, Donald R.; Schwab, Fred (1996). Sedimentary Geology. New York: W.H. Freeman and Company. pp. 300–302. ISBN 0-7167-2726-9. ^ Jones, M.H. (2011). The Brendon Hills Iron Mines and the West Somerset Mineral Railway. Lightmoor Press. pp. 17–22. ISBN 9781899889-5-3-2. ^ Jones (2011), p. 99. ^ a b Jones (2011), p. 16. ^ Jones (2011), p. 158. 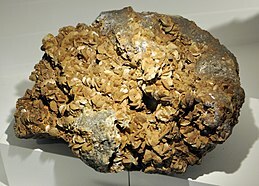 Wikimedia Commons has media related to Siderite. This page was last edited on 2 December 2017, at 21:11 (UTC).